to take. The severity and type of fracture depends upon the force that caused it and the bone itself. If the force is only slightly past the breaking point of the bone, it may crack, never fully coming apart. If the force is much more than the bone could bear, such as in a car accident, the bone may shatter. Any bone in the body can fracture and each bone has its own weight tolerance. Most often, a bone fracture is caused by a strong force such as falling from a height or getting into a car accident. Also, repetitive motion can tire the muscles and place more force onto the bone itself. This is one of the causes for stress fractures, commonly seen in those that often partake in athletic activities. Osteoporosis weakens bones and therefore those that have it are more prone to fractures. Stable – The broken ends of the bone meet and pretty much line up. 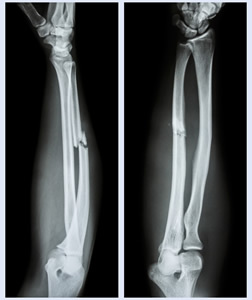 Oblique – The fracture is at an angle. Transverse – The fracture is horizontal. Impacted – The bone fragments are driven into each other. Spiral – At least one part of the fragmented bone is twisted. Comminuted – The bone shatters into three or more fragments. Greenstick – The bone bends and cracks, instead of breaking. This occurs most often in children due to the softness of their bones. Stress – There’s a hairline crack in the bone. Open – Either the bone pierces the skin or the force that caused the fracture also caused an open wound in that spot. This type of fracture is more prone to infection for both the bone and the wound. Treatment varies widely depending on which bone is fractured and what type of fracture it is. The fundamental goal of treatment, though, is the same. A doctor will put the pieces of bone back into position and prevent them from shifting until they are healed. The most common treatment for a broken bone is fitting a cast. The doctor will position the bones correctly and then fit a plaster or fiberglass cast onto the affected area (commonly arms and legs). Braces are also sometimes used. They do not provide the same level of protection as casts but they allow for more movement. Fixation is a process in which metal screws or pins are place in the broken bone around the fracture to stabilize the area while the bone is healing. The fixator can be either external or internal, external being temporary, while internal would be permanent. If you think you may have a fractured bone, seek medical attention as soon as possible. Call Orthopaedic Associates of St. Augustine at 904-825-0540 or request an appointment online.